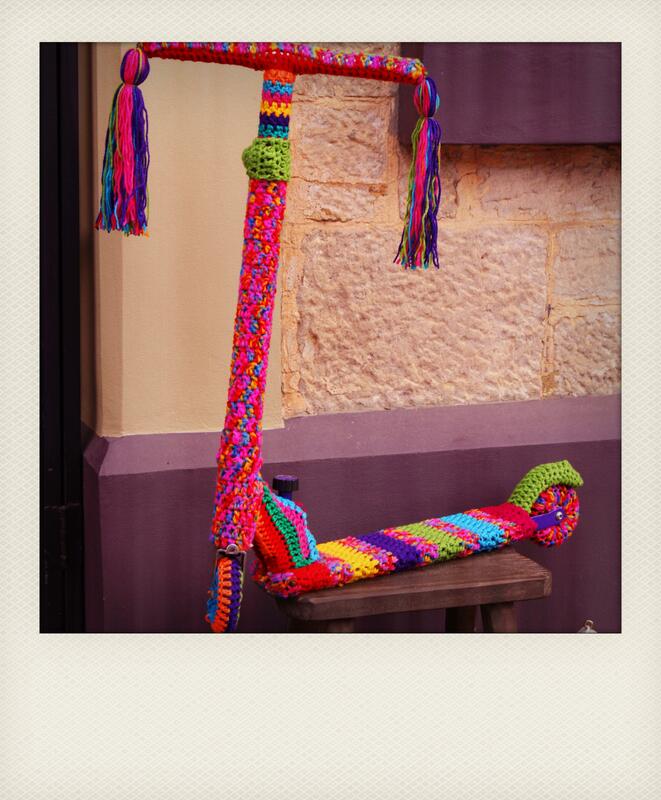 I SNAPPED THESE POLAROIDS OF THIS GREAT YARN BOMBED BICYCLE ON RUNDLE STREET IN ADELAIDE, BACK IN 2012. 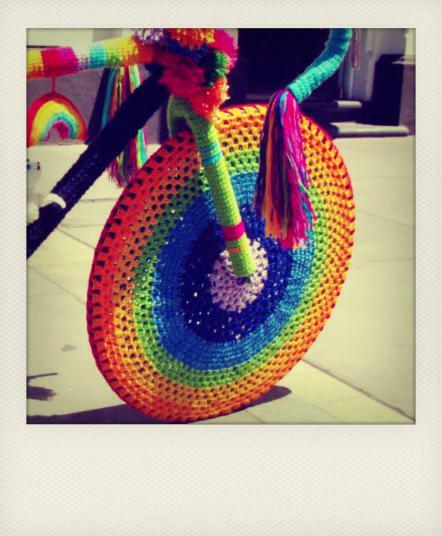 I LOVE THE CROCHET OWL & RAINBOW KNITTED CROSSBAR. 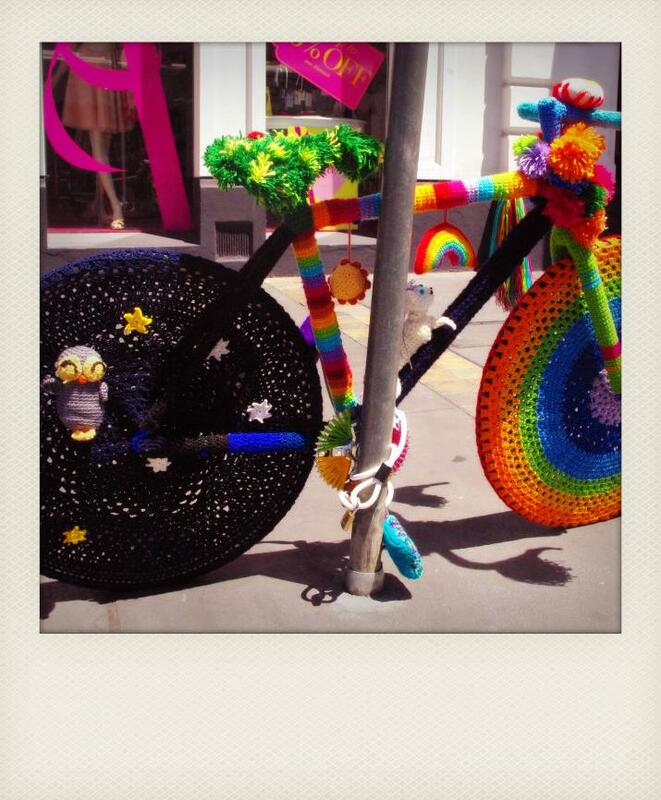 This entry was posted in Uncategorized and tagged adelaide, bike, crochet, knitting, photography, polaroid, yarn bombing on January 7, 2013 by yarnbomb. 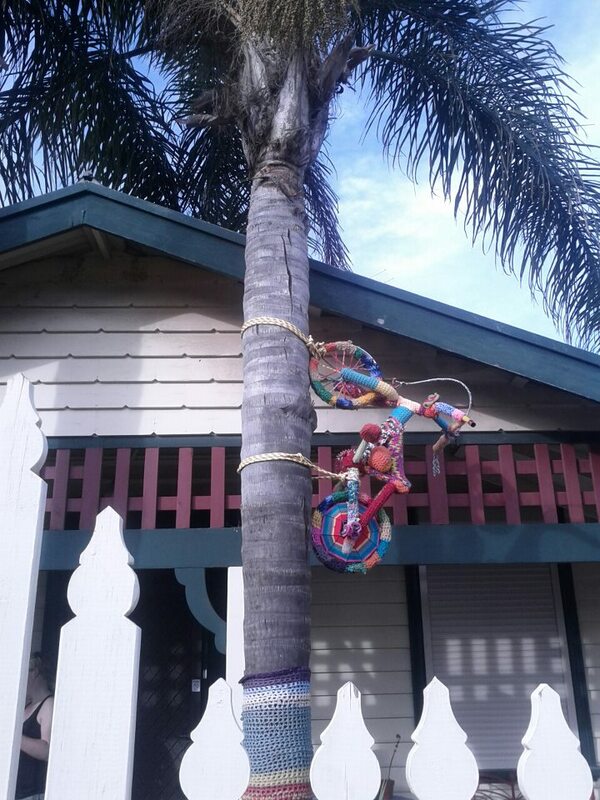 2012 WAS THE YEAR I TRULY EMBRACED YARN BOMBING. 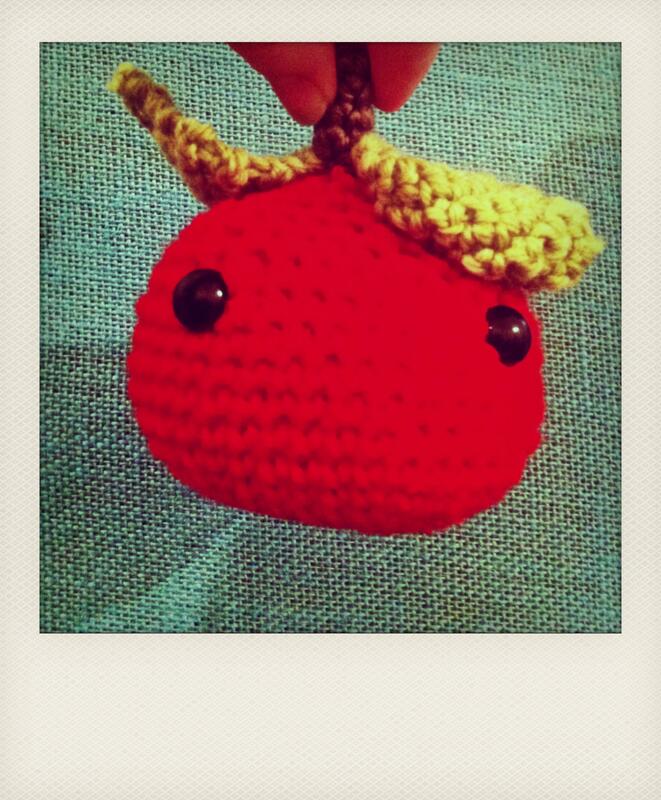 BELOW ARE A HANDFUL OF POLAROIDS OF SOME OF MY PROJECTS FROM THE PAST YEAR. 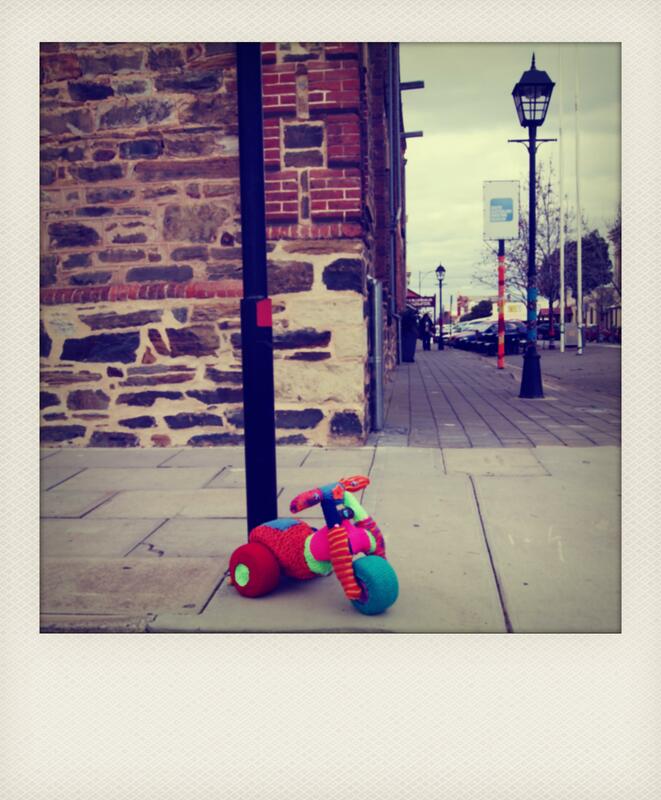 A COLOURFUL POLAROID OF ONE OF MY FAVORITE YARN BOMBING PROJECTS. 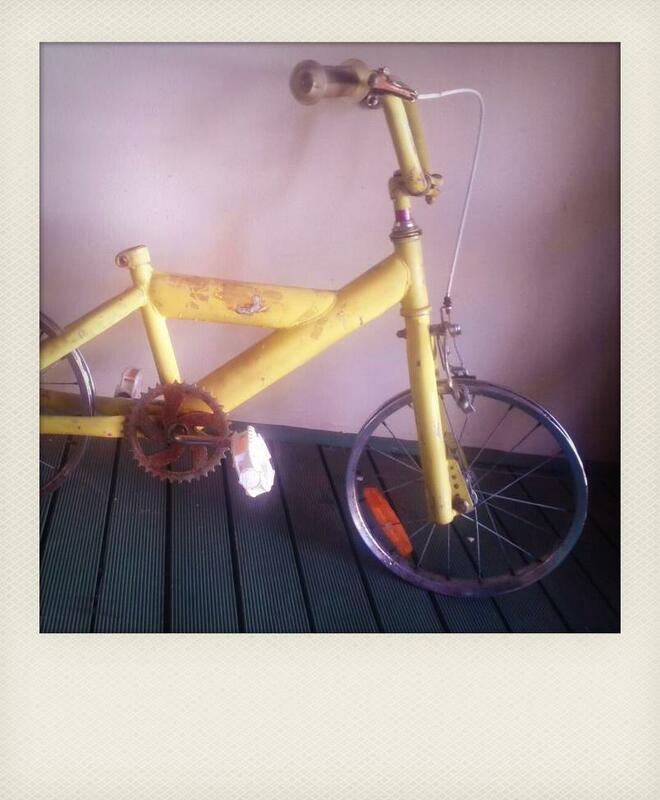 A BROKEN KIDS BIKE THAT I FOUND IN THE NEIGHBOURS RUBBISH PILE & BROUGHT BACK TO LIFE WITH KNITTING & CROCHET. I STUFFED THE HANDLE BARS WITH POLYFIL TOY STUFFING TO FATTEN THEM UP. I AM BASICALLY SCARED OF GUNS. I THOUGHT I WOULD SOFTEN UP THESE TOY GUNS BY COVERING THEM IN CROCHET & KNITTING. 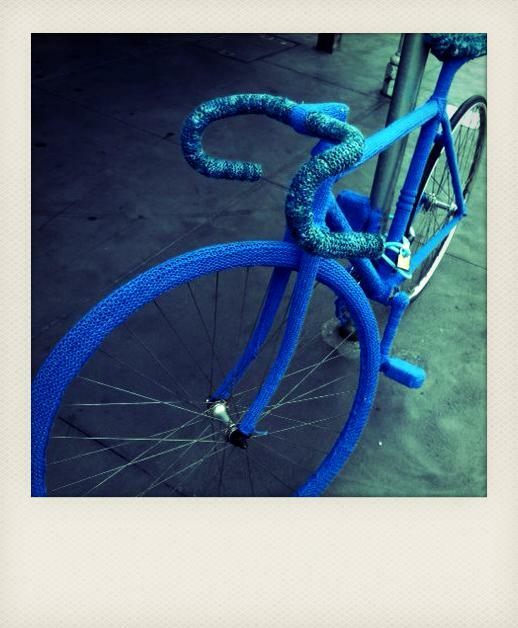 This entry was posted in Uncategorized and tagged bike, crochet, knitting, photography, polaroid, yarn bombing on December 29, 2012 by yarnbomb. Yarn bombed kids bike, decorated with knitting. 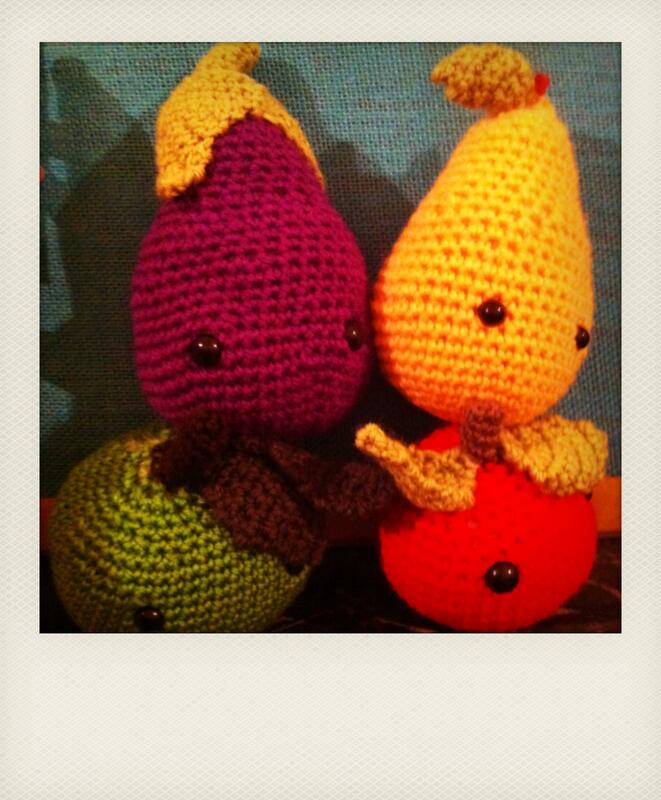 Crochet fruit made by Sarah-Jane cook. 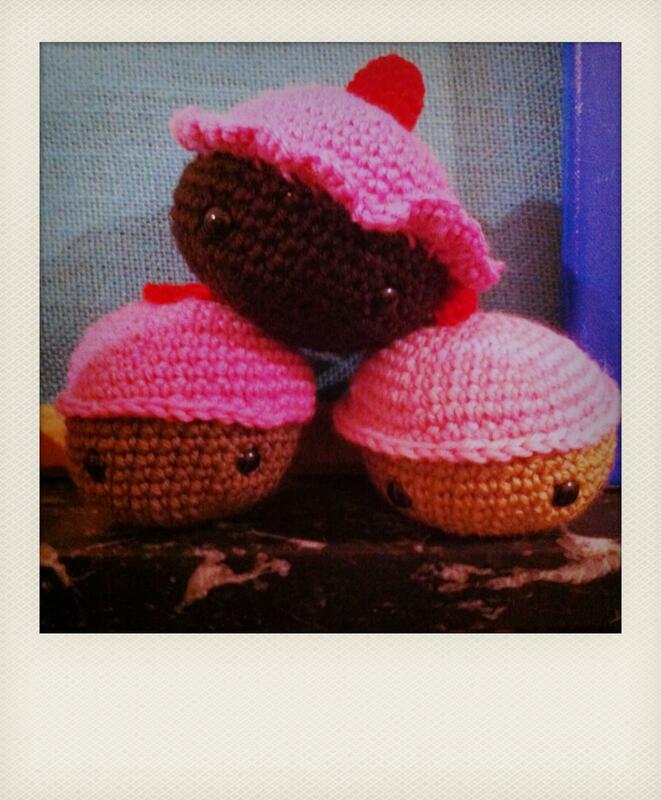 Crochet icing and cherry topper. 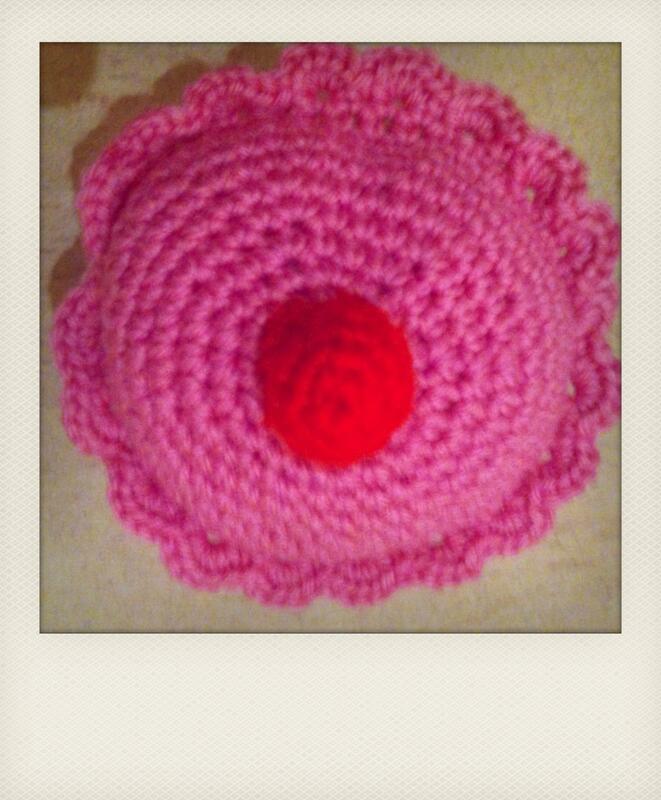 This great flower design tea cosy was bought buy a friend from the beanie festival in Alice Springs. 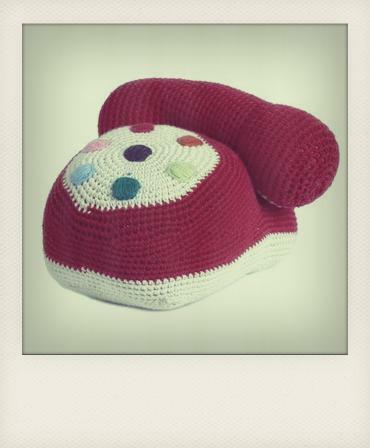 Cosy by Kate B Designs. 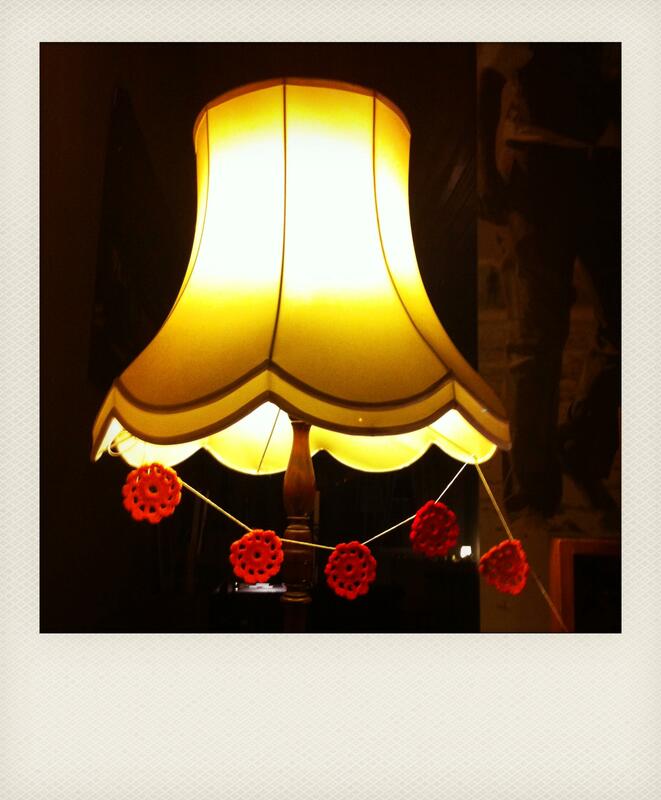 This lamp shade has been adorned with little crochet rounds. 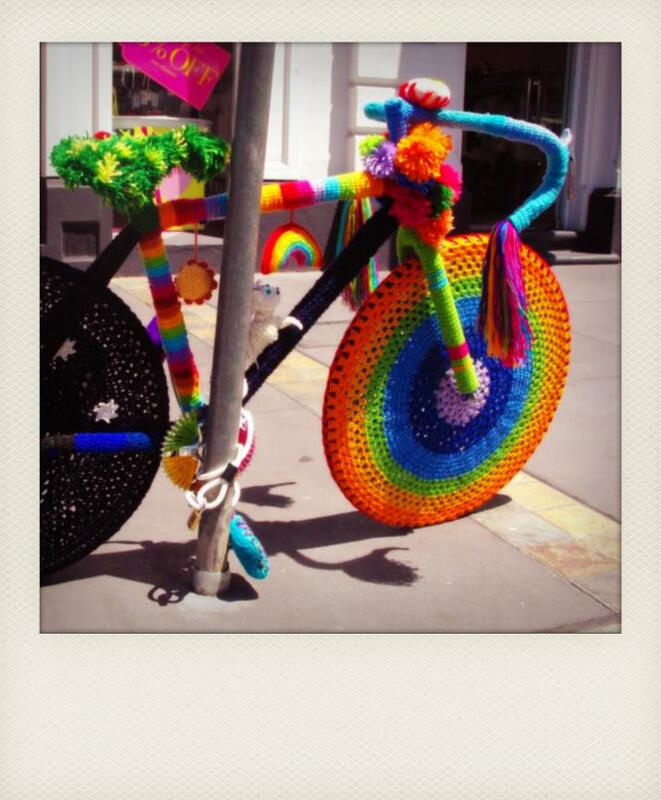 This entry was posted in Yarn bombing and tagged bike, craft, crochet, knitting, photography, polaroid, scooter, yarn on July 26, 2012 by yarnbomb. 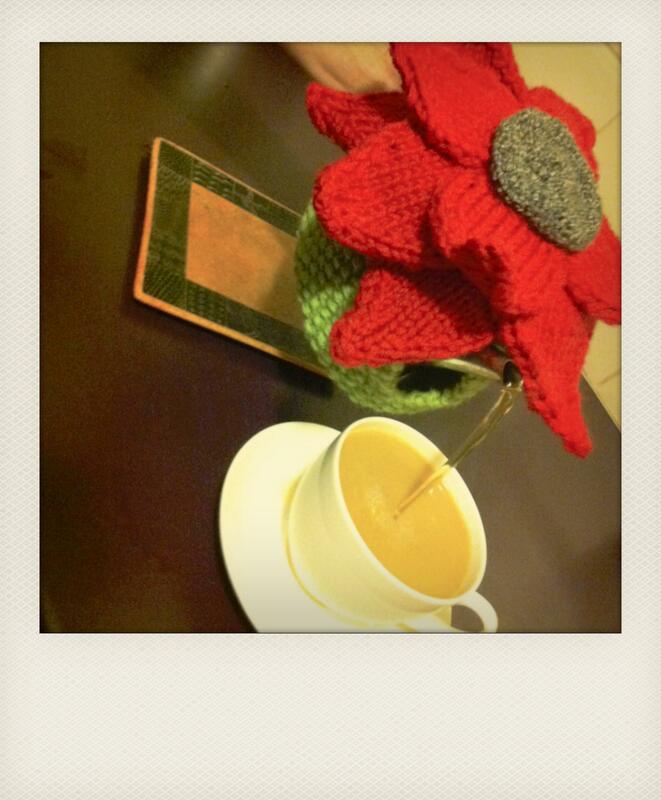 All good yarn bombers appreciate a good cup of tea. 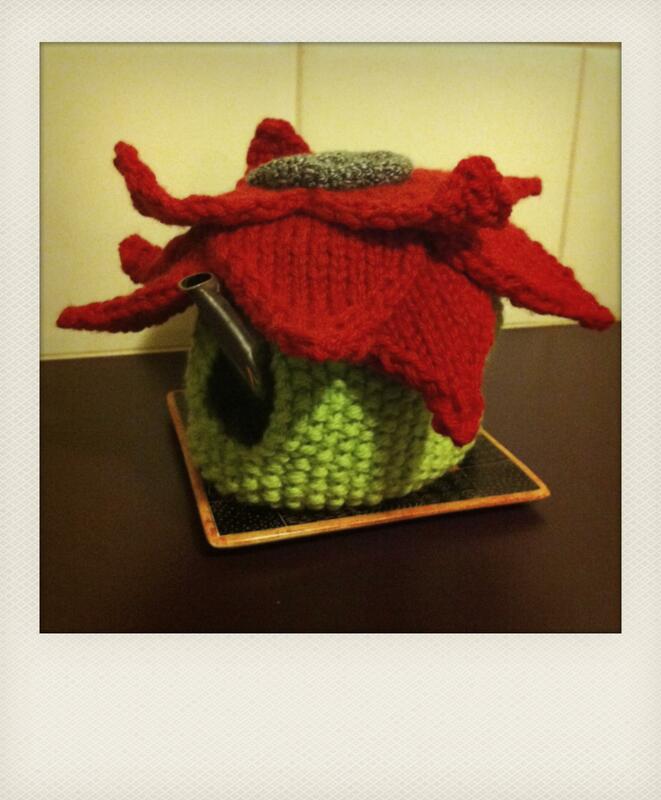 Tea & knitting go together like a diamond & a pearl. 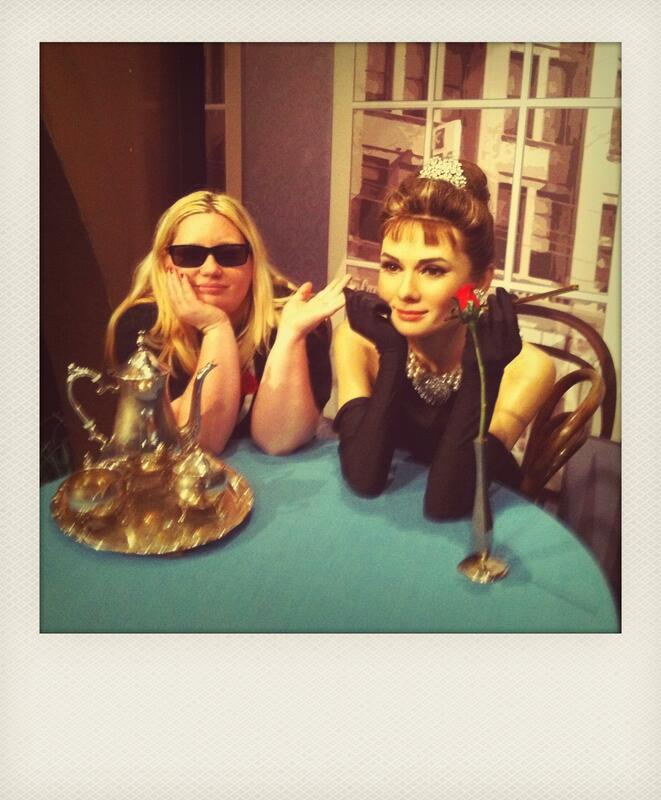 So when I’m not knitting, crocheting, yarn bombing or blogging, I like to take tea at Tiffanys with the lovely Audrey. 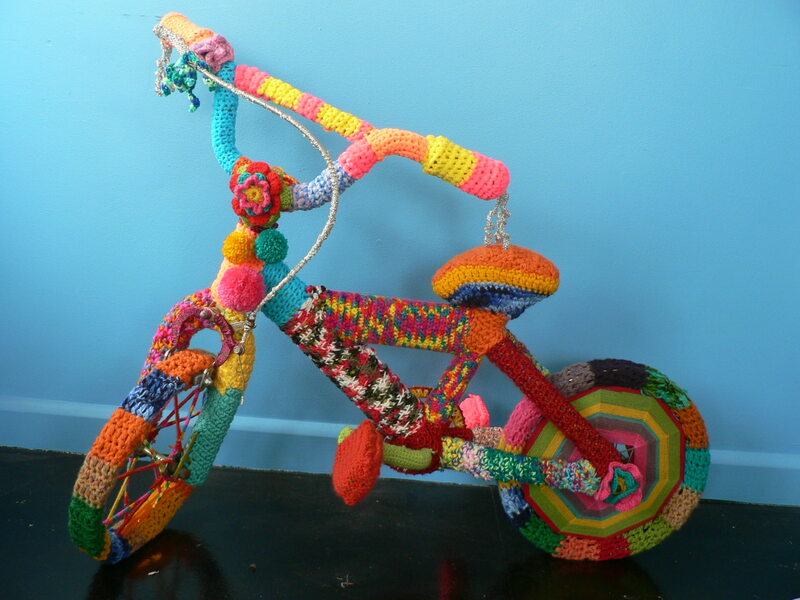 This entry was posted in bikes, toys, Uncategorized, Yarn bombing and tagged bike, craft, crochet, knitting, phone, yarn bombing on April 12, 2012 by yarnbomb. 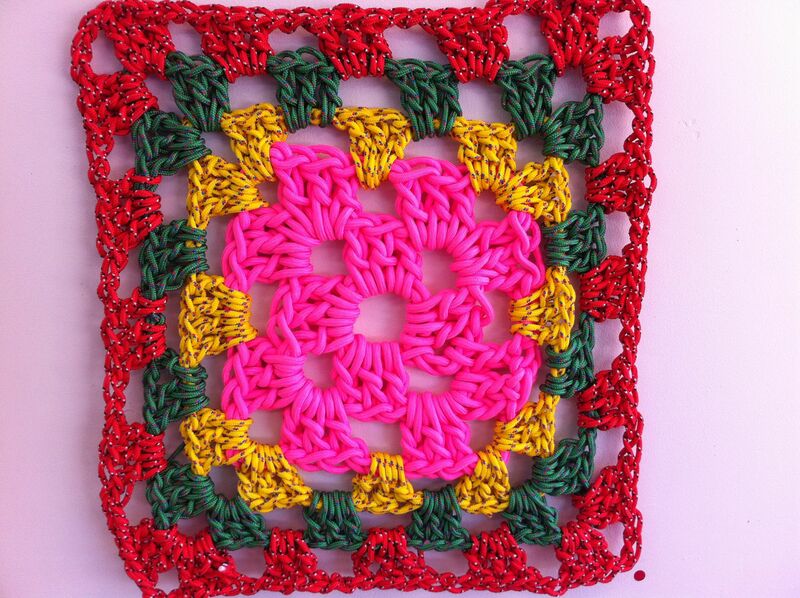 This giant crochet square was made by my craft club sister Nunya. She made this with rope from the local hardware store. 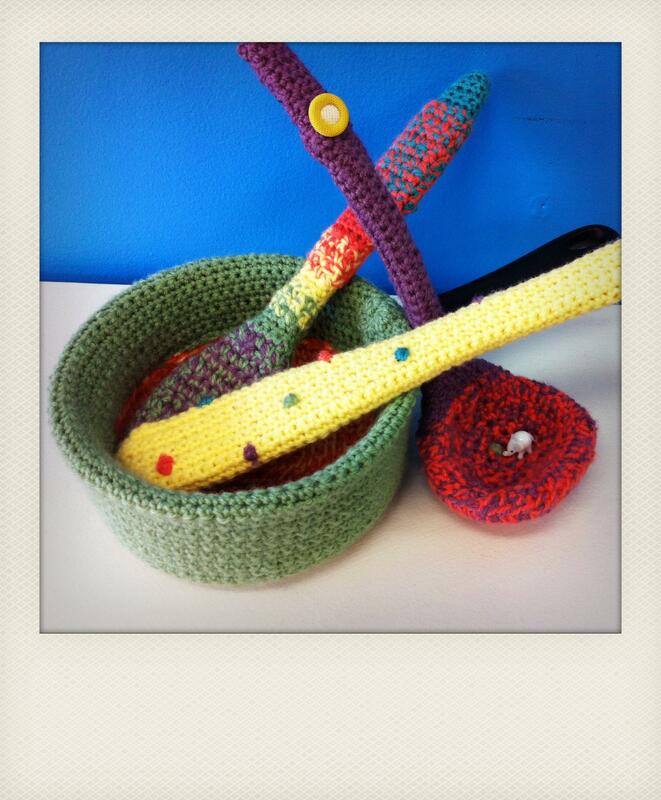 These kitchen utensils were yarn bombed by my buddy Mellisa. There is a saucepan, a wooden spoon, a spatula & a ladle with a tiny white elephant living in it. 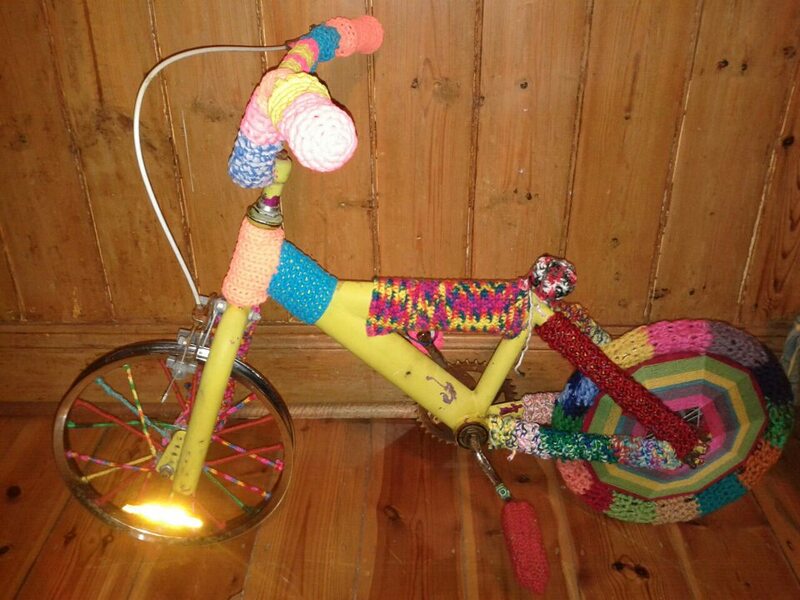 My friend sarah-Jane yarn bombed her childhood tricycle. 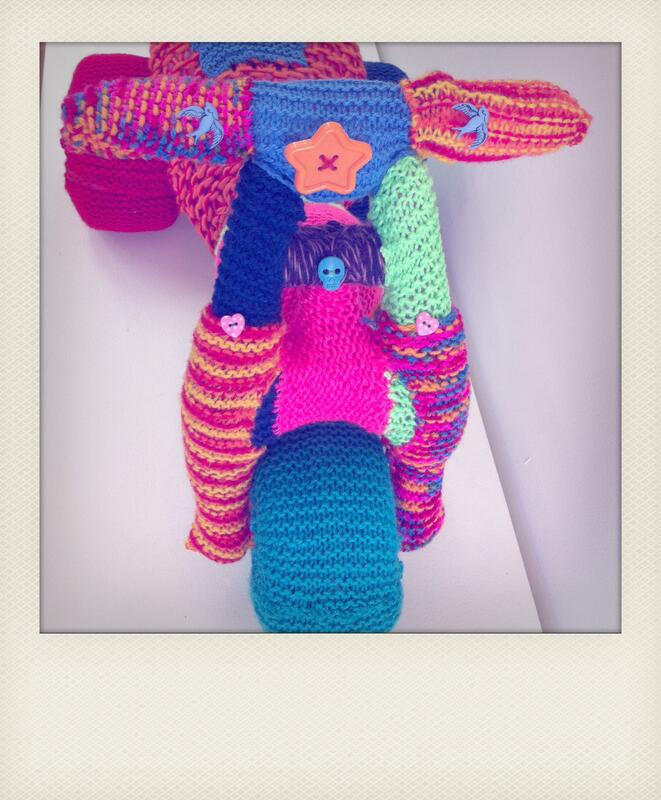 I was inspired by sarah-janes tricycle to yarn bomb my squishy little bike. 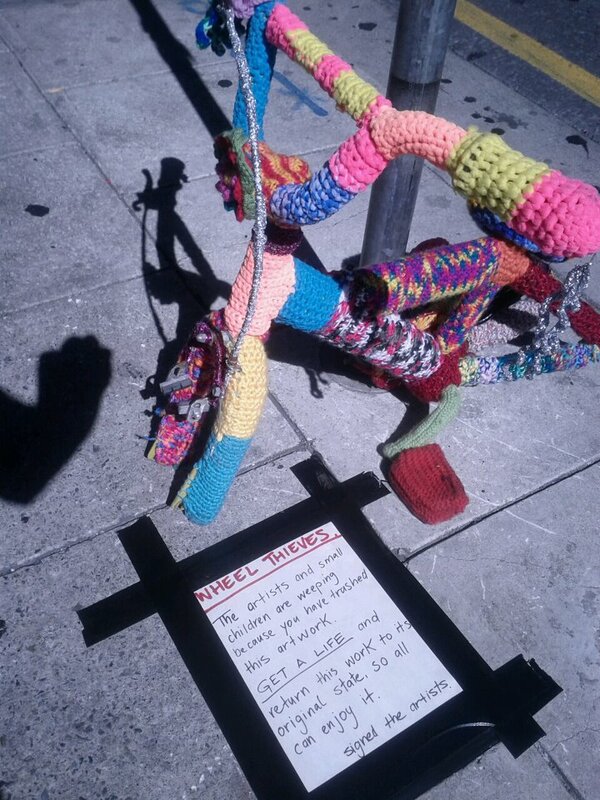 This entry was posted in Yarn bombing and tagged bike, crochet, tricycle, yarn bomb on March 31, 2012 by yarnbomb. 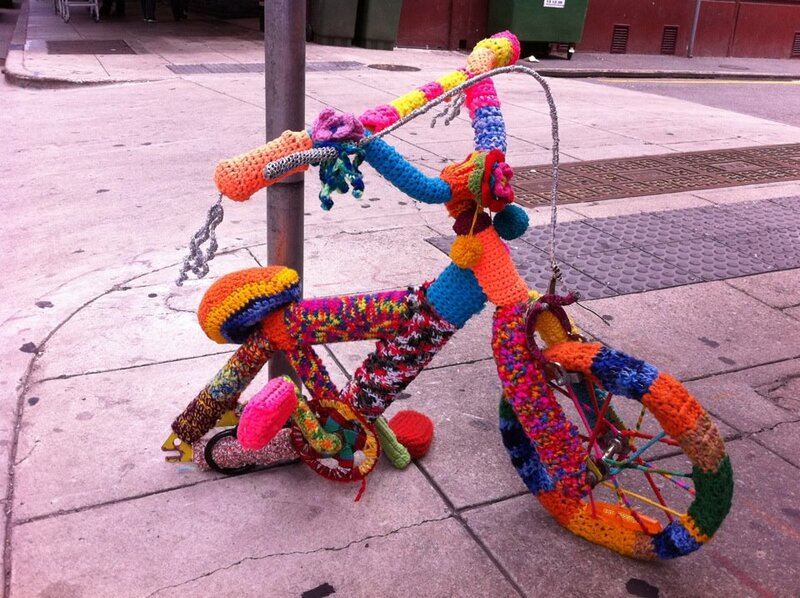 The anatomy of yarn bombing a bike. 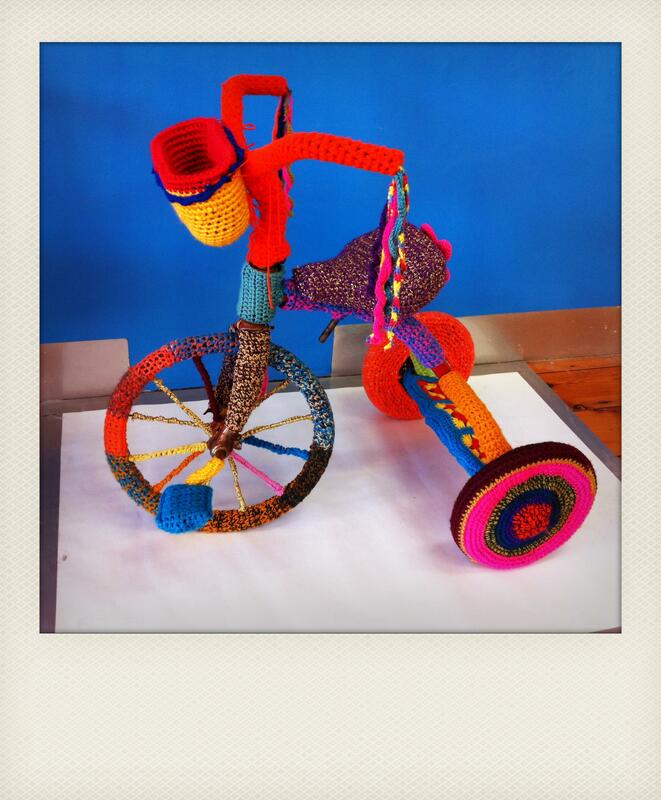 We started with a retired old bike & we knitted & performed feats of crochet as we slowly covered the bike from wheel rim to handle bars with yarn bombing. 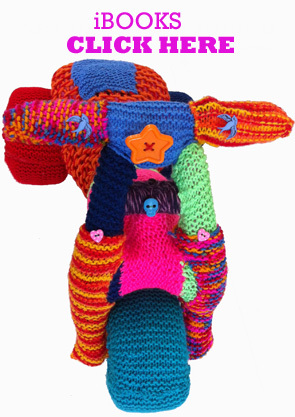 Here is the centre of the handle bars. 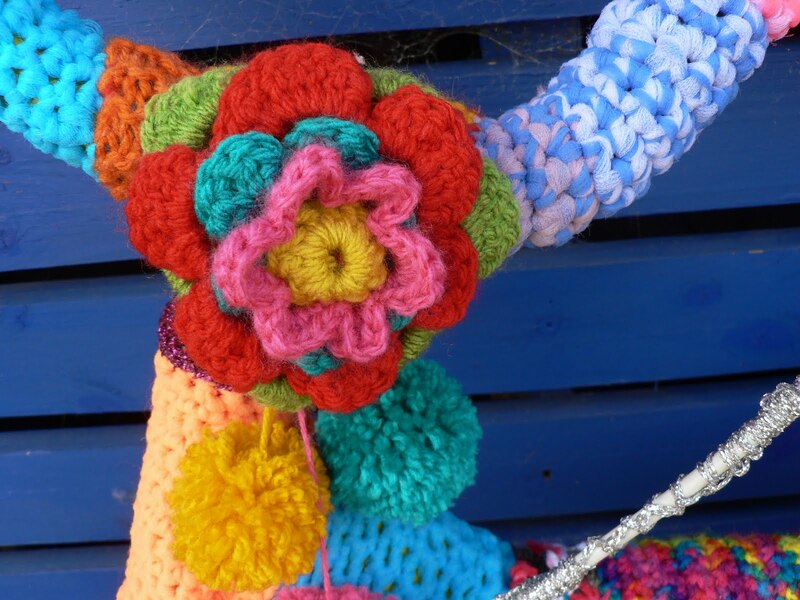 The flower detail is crochet with dangling pompon’s. 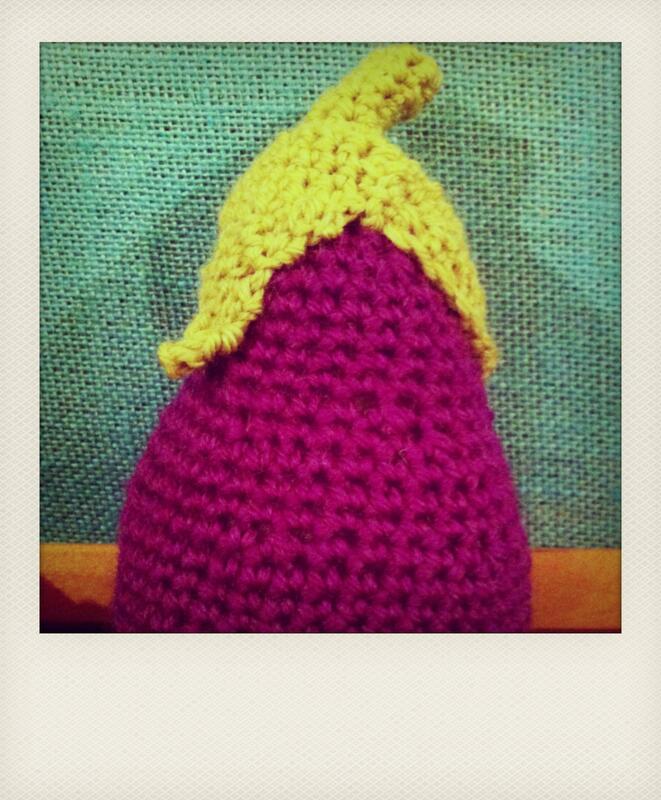 The finished product is colourful, squishy & fun. 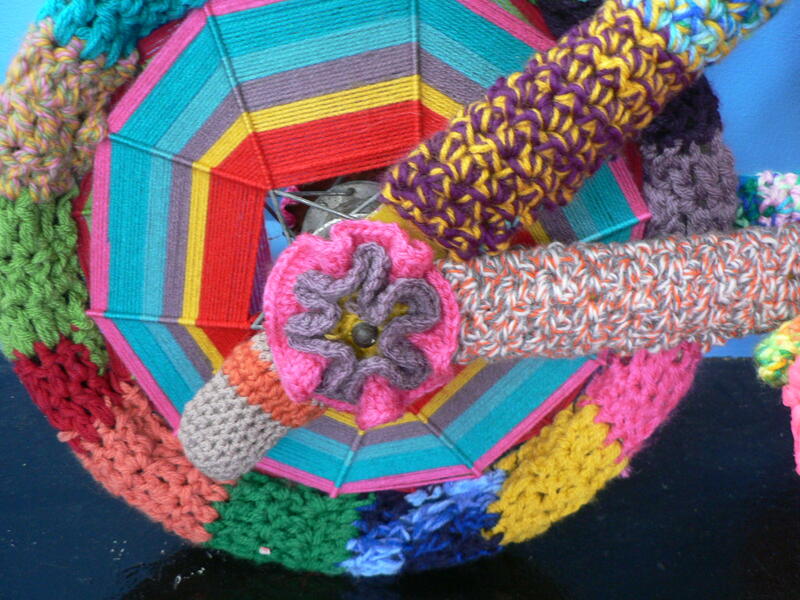 This is the peddle cog & its been hand wrapped in yarn & crochet. 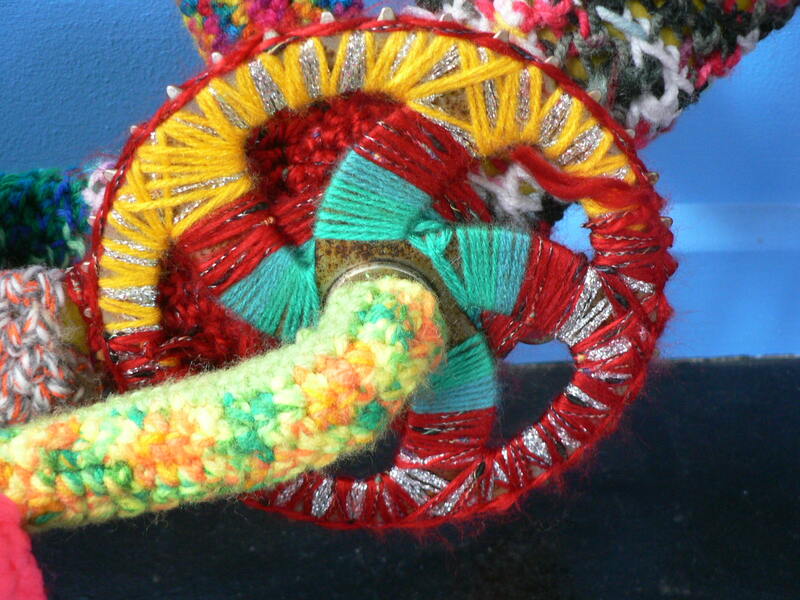 This wheel is a work of yarn bombed art in itself which could explain why the wheel was stolen. First one wheel was taken followed by the second wheel. This note led to the final return of our wheels, unfortunately they were in poor condition when we got them back. 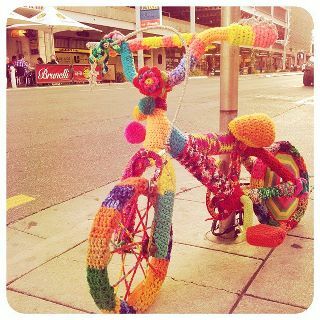 This entry was posted in Uncategorized and tagged bike, crochet, knitting, yarn, yarn bomb, yarn bombing on March 28, 2012 by yarnbomb.